Fraser Coast Bolts is located 3.5 hours North of Brisbane, in Hervey Bay, overlooking world heritage listed Fraser Island. 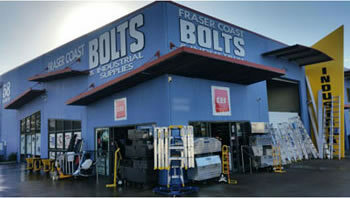 Fraser Coast Bolts is a family owned and operated business which was established in 1997. With more than 40 years combined experience, our staff offer the highest level of service along with accurate advice and product suitability. Through the support of our loyal customer base and the assistance of an expansive supplier network, we are experiencing substantial growth in both our business and product range. Whether you want just one bolt or a 1,000 bolts, you will always receive the highest level of quality service at Fraser Coast Bolts. We are a member of CSS (Construction Supply Specialists), a leading buying and marketing group serving the construction, industrial and mining sector. As part of the group, we're harnessing the volumes of over 70 businesses to obtain corporate multi-national buying power with the discounts passed on to you. Copyright © 2016 Fraser Coast Bolts.